Archive photo Chad Johnson is back for his senior season for the Colonel Crawford Eagles track squad and will be looking to add to his trophies, medals and various other honors in 2018. NORTH ROBINSON — Colonel Crawford High School’s track and field teams hope to continue their long run of success this year. Both the boys and girls squads will do so under familiar leadership in Preston Foy (boys) and Jody Grove (girls). Foy is in his ninth year while Grove has 37 years of coaching under her belt. Grove also pulls double-duty as the distance coach for Crawford. Foy and Grove are joined on the coaching staff by Paul Gladden (pole vault), Brad Ruffener (throws), Kim Mutchler (high jump), Joey Bauer (hurdles) and Brett Degray (sprints/relays). Crawford’s boys team will see the return of a state champion from a year ago and will look to defend its Northern-10 Athletic Conference title, as well as their district title. Senior Chad Johnson will suit up for his final season in the black and yellow before heading to Iowa State next fall to run. 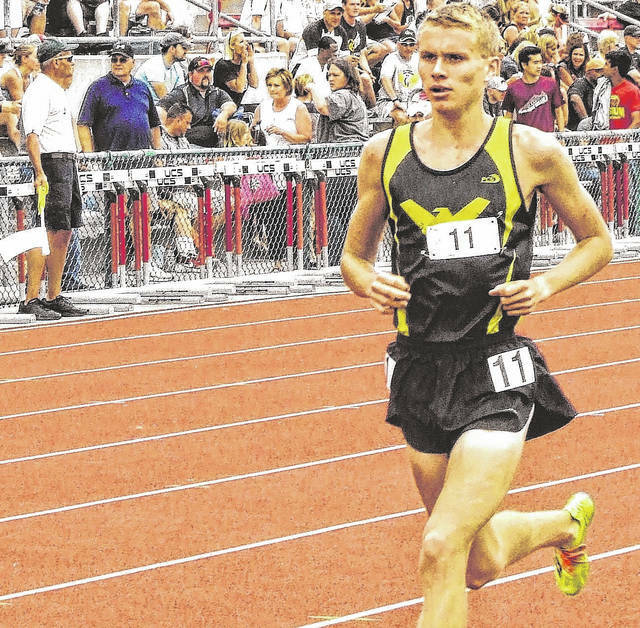 Coming off of a cross country state title and an indoor track national title, Johnson leads a crop of distance runners who always seem to fare well. Johnson won the 3,200-meter state title last year with a time of 9:20.38. He is joined by fellow seniors and returning letterwinners Brody Martin (mid-distance), Wade Hopkins (distance), Kaleb Landin (sprints, pole vault) and Harley Shaum (sprints, high jump). Juniors Colton Rowland (sprints), Owin Seevers (jumps) and Braxton James (distance) also returnto the track this spring. Senior Drake Delong and junior Jonah Studer will lead the throwers for the boys. Also looking to make an impact are junior Dylan David (hurdles), sophomore Alex Mutcher (PV) and freshman Seth Carman in the sprints and the long jump. The Lady Eagles also will be on the hunt for a pair of four-peats of their own after narrowly escaping Upper last year by just 2.5 points. They will have to do so without Claire Ehmann, Anna Reffey, Emily Kemper, Sam Mutchler, Kirsten Vehrs and Ashley Gwirtz, who were all vital to last seaspn’s success. In fact, Mutchler qualified for the state meet in the high jump and was part of the state qualifying 4×100-meter relay team, with Pierce Krassow, Reegan Goyer and Vehrs. Pierce and Reegan are still around though for their senior and junior seasons, respectively. Krassow is primarily a thrower for Grove and Goyer will be involved heavily in the sprints. Joining Krassow and Goyer will be Courtney Britt (mid-distance), Kari Teglovic (distance) and thrower Jillianne Gregg. Also returning will be Katie Hopkins (distance), Jenna Siegel (sprints), Hannah Willacker (distance) and Kiersten O’Rourke (sprints, high jump). Colonel Crawford is set to kickstart their season with a trip to Waynesfield-Goshen High School to compete in the annual Joe Horn Invite on Saturday, March 24. The first home meet of the season is set for Monday, March 26 when the Eagles will host the visiting Galion Tigers and Crestline Bulldogs at 4:30 p.m.
https://www.galioninquirer.com/wp-content/uploads/sites/38/2018/03/web1_chad-johnson.jpgArchive photo Chad Johnson is back for his senior season for the Colonel Crawford Eagles track squad and will be looking to add to his trophies, medals and various other honors in 2018.